Murder! Darkness! Betrayal! Evil! Those scary words could only mean one thing; it's time for another Light Grey Game Night! Mark your calendar for Wednesday, April 30th from 6:30 to 9:30 PM! As you might remember, we're attaching a theme to each night to help people narrow down what games they might want to bring (although you're still welcome to bring whatever you'd like!). This week's theme is Horror/Mystery! 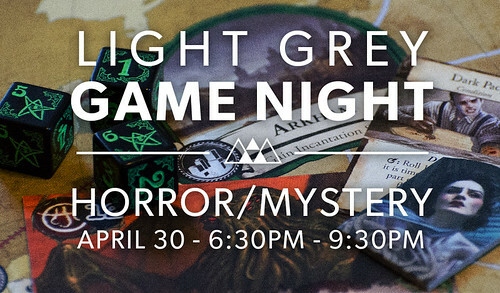 So bring a change clothes because you're bound to wet your pants battling Dracula in Castle Ravenloft, slinging paranoid accusations in Ultimate Werewolf, searching out a stealthy murderer in Clue, or scrambling around the globe desperately trying stop the Old Ones from awakening in Eldritch Horror, among plenty of others! If you have a favorite mysterious board game, bring it!